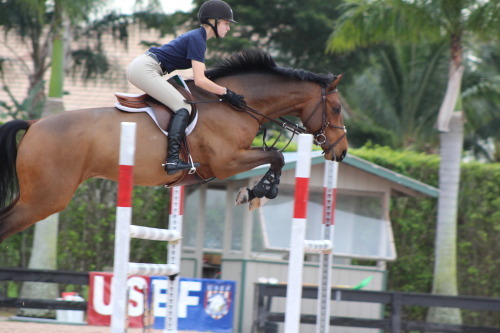 Lillie Keenan at the 2014 George Morris Horsemastership Clinic in Florida. I am sure most of you know who George Morris is, but in the rare event that you don’t, he is basically the “guru” of hunter seat equitation. The trainer with whom I trained for 10 years rode under him, and that has become very apparent to me as I’ve learned more about George Morris and watched/read more of his stuff. Pretty much everything that was drilled into my head as a young rider is stuff contained in Mr. Morris’ book Hunter Seat Equitation . If you do not own this book, and you are a hunt seat rider, I highly recommend you purchase it for yourself. It contains well-written descriptions of performing essential hunt seat equitation skills, and there are also pictures – though a bit dated – of what Mr. Morris considers to be “good” hunt seat riding. I am a visual person, so seeing someone perform a skill always helps me 10x more than it being described to me. While I have watched many YouTube videos of Mr. Morris’ clinics, this was the first year that I watched his clinic from start to finish. In full disclosure, I only watched Group 1, because that was the group in which Lillie Keenan was riding. Lillie Keenan is a good 9 years younger than I am, but she is a riding goddess. I learned a lot from Mr. Morris’ clinic, and I picked up some exercises that I am going to use with my horses when I ride (if this darn weather ever gets it’s you-know-what together). So, in honor of the most recent clinic, I put together a bunch of my favorite quotes, which I also live-tweeted on my twitter account, legaleq. Some of these relate to technical aspects of riding, while some are just remarks Mr. Morris made about himself, modern-day riding style, or horse-related things in general. “You should envy my hands because it took me 70 years to develop them. The secret is give.” This is one of my very favorite things Mr. Morris said. I am a recovering handsy rider, and my trainer often yells “give” at me, even if it’s just to remind me to keep thinking “give” in my mind. This quote is absolute hunt seat equitation perfection. “The best canter exercise is counter canter because it automatically forces collection and balance.” A lesson pony I ride has a tendency to take roll-back turns on the wrong lead, and I never can tell because he is so damn balanced when he does it. “Of course Lillie looks like that. I’d expect her to look like that after winning all these championships.” If you have not seen her ride, seriously YouTube her. Everything she does is textbook form. “The quick fix for the leg is the stick.” I appreciated this one because I am learning how to get acquainted with the crop again after riding some horses that didn’t necessarily have the most respect for its meaning and engaged in some naughty behaviors upon usage that quite frankly scared an already non-confident, younger me. “At any opportunity take your feet out of the stirrups.” I, for one, love no stirrup work. I’m not trying to be a show off or go against the grain. I find that my leg and seat are always better after I’ve done no stirrup work, and just the little amount I did over the summer has drastically helped my position at the canter. Though I must say my least favorite no stirrups exercise is posting at the trot. Talk about a leg burn. “A horse show is simply a periodical test of where you and your horse are.” I always beat up on myself for not showing, but I appreciated Mr. Morris’ take on what showing actually is compared to what modern-day trainers and show barns have made it. “Most of my life riding I made mistakes. Don’t beat yourself up.” A key, key, KEY thing to remember, for anyone. I need to tape this to my forehead. “I still work once a week a horse for 45 minutes without stirrups.” Must. Remember. This. Did you watch the latest Horsemastership Clinic? What did you think, and what were your favorite quotes? If you haven’t read my review of SmartPak’s Insulated Water Bucket Cover, you should probably do that before you read this update. My horse enjoying his water, sans bucket cover because he destroyed it, but drinking water in the winter is always good, so I’m sharing anyway! I’m assuming most of my US readers live in states that do not include Florida, because apparently Florida was the only state that had weather that wasn’t bone chilling cold today. By the way, if you live in Florida, I envy you and your warmth right now. Today’s high was a whopping 5 degrees, but it never felt like 5 degrees (whatever that feels like) because the windchill was anywhere from -7 to -20. Had I known it was going to get this cold, I probably would’ve held off on my product review, because this is the test of all tests. Granted it doesn’t really ever get this cold in New Jersey, I figured if there was ever a time to see if an insulated water bucket cover worked, now would be the time. So after putting on four shirts, three jackets, two pairs of pants, two pairs of socks, a hat, gloves, and snow boots, I got myself into my car and drove to the barn. I am pretty much at the barn everyday unless my school schedule doesn’t allow, which is rare. But anything else – I’ll be there. Migraines, the flu (which I currently have), work, torrential downpours that render visibility to zero (yes, I’ve actually done this), hurricanes (Sandy was no match for my determination to see my boys).. I will be at the barn. If not, anyone around me can deal with my horse withdrawal miserable attitude, so I figure we all benefit from my craziness. Pony enjoying his non-frozen bucket cover water. Anyway, when I arrived, the barn doors were shut tight. Believe it or not, shutting the barn doors keeps the temperature inside relatively comfortable, so even though I might not have a fancy heated barn, it isn’t half bad. I wasn’t even thinking about the bucket cover until my barn manager told me that my pony’s water bucket (with the cover) had very thin ice compared to the others that didn’t have bucket covers or any method of heating the water. I was surprised considering the cover was no match for the last cold day we had. I checked it out myself, and sure enough, the water had a very tiny bit of ice in it, but nothing that would prevent my pony from drinking. Obviously, the fact that the barn was shut very tight probably had something to do with the water not freezing as much, but my barn manager did also say that the bucket with the cover was less frozen than the other waters, so I guess it is doing its job. Would I recommend using the cover on an outside bucket for horses on 24/7 turnout? Probably not. I don’t think it can withstand very cold temperatures like the teens and single digits. But in an older barn that doesn’t have heat but can be completely shut to prevent cold airflow from making its way in, I’d say that it is a worthwhile investment, especially if other options, such as heat, aren’t ideal.